At my birthday dinner, I wanted to have favors for each friend attending. I made these up in a snap using the Celebrate You Thinlits, which I got for free when I placed my order during Sale-A-Bration. This year Stampin' Up! is offering two items that you may choose if you reach $100 in merchandise. I chose the Thinlits. There is a coordinating stamp set you can choose as a free item as well. To make the "celebrate" substantial enough to tie onto the package, I first cut it out of the Foil Frenzy Specialty Designer Series Paper and backed it with a second cut out using Berry Burst card stock. I hope you like my easy way to dress up a package! 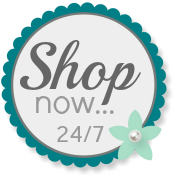 Please use my Online Store any time you wish to purchase you Stamping' Up! and earn free Sale-A-Bration products.